The good news is that I’ve ended up with a nice example of this card. Certainly a lot of NM qualities. The trivia question asks who led the AL in homers in 1963. That would be Harmon Killebrew, who actually led both leagues with 45. O’Dell’s rookie card appeared in the 1955 Topps set, despite the fact that he didn’t pitch at all in the majors that year. (NOTE: Jim in the comments correctly notes that O’Dell missed 1955 due to military service. He never actually pitched in the minors). 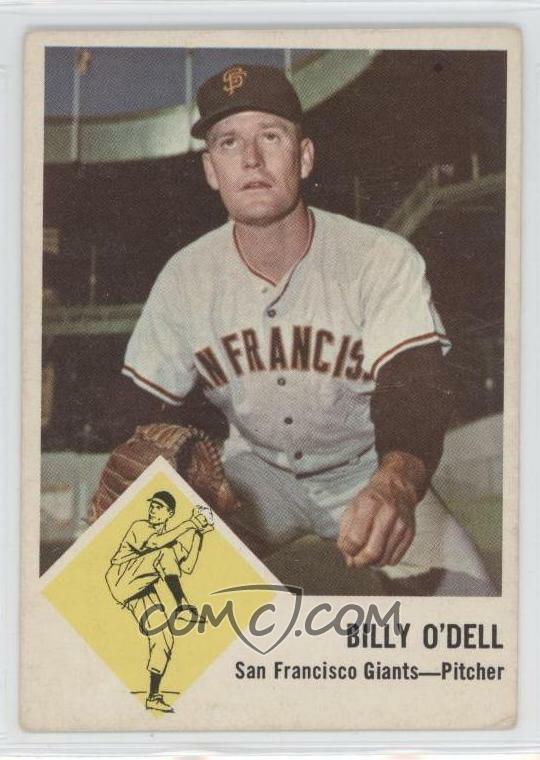 O’Dell also has the distinction of being the subject of the 66th and final card in the famous 1963 Fleer set (which was intended to be a full set but never made it past the first series). In 11 full seasons pitching for the Orioles, Giants, Braves and Pirates, Billy O’Dell only had 2 bad seasons. In fact, he retired with a 105-100 record and 109 career ERA+. So O’Dell was a competent pitcher for most of his career, and played in 2 All-Star games (1958 and 1959). O’Dell came up with Baltimore, getting brief call-ups in 1954 and 1956 before finally sticking with the club in ’57. Over 3 full seasons with the O’s, O’Dell posted a 2.86 ERA and 1.13 WHIP. His ERA+ of 128 over that period made him one of the bright young pitchers in all of baseball. But since his record was only 28-33 he was probably seen as expendable, and the Orioles dealt him to San Francisco as part of a deal for so-so outfielder Jackie Brandt. 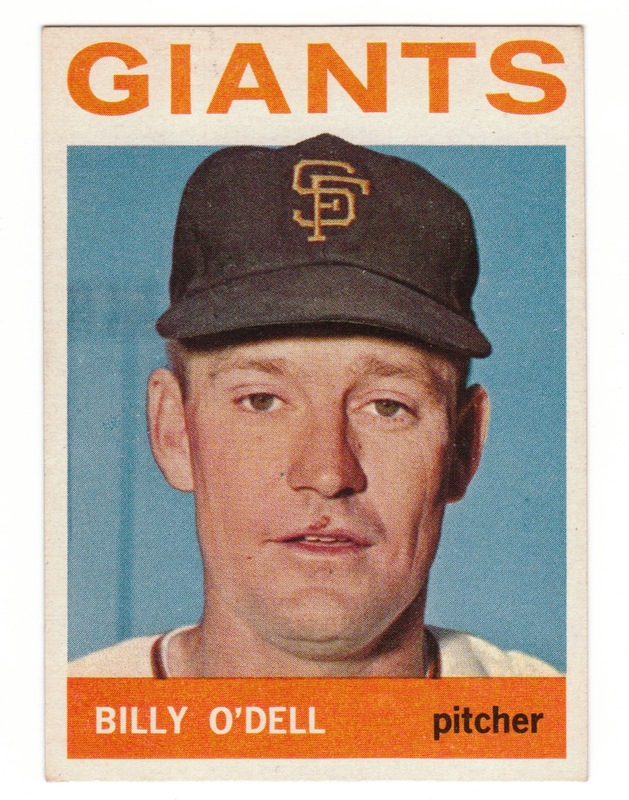 O’Dell continued to deliver solid numbers with the Giants, most notably in 1962, when he went 19-14 with a 3.53 ERA, 20 complete games and 195 strikeouts. He only gave up 18 homers in 280.2 IP. 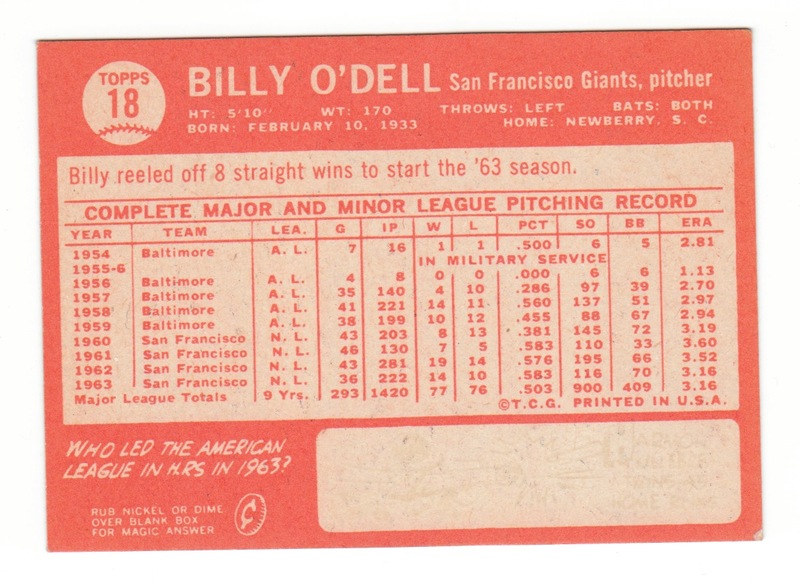 In the 1962 World Series, O’Dell took the loss in Game 1, giving up 5 earned in 7 1/3 innings of a 6-2 defeat against the Yankees at Candlestick Park. He wouldn’t start another game in the series, but picked up the save in Game 4 at Yankee Stadium and threw the last 2 innings (scoreless) of a 1-0 Game 7 loss. O’Dell started the 1963 season 8-0, but ultimately went 14-10 (though he didn’t pitch all that differently later in the year). In 1964, he got off to a rough start and was pulled from the rotation early in the season. Still struggling out of the bullpen, he got another chance to be a starter and on July 18 threw his only CG of the year (2 ER in a tough-luck 2-1 loss to Houston), but followed that by allowing 11 ER in his next start. O’Dell finished ’64 with a 5.40 ERA in only 85 innings. He was traded in the offseason to Milwaukee for Ed Bailey. He had a terrific season as a reliever with the Braves in 1965, posting a 2.18 ERA (161 ERA+) with 10 wins and a then-gaudy 18 saves in 111.1 IP. He regressed a bit in 1966 (his ERA was still good, though) and the Braves traded him to Pittsburgh for Ed Schwall. He finished the season with decent numbers for the Pirates, but plunged to a career-worst 5.82 ERA in 1967. That season, he started out well, going 4-0 out of the gate. But a dismal stretch of three starts in mid-June found him banished to middle relief and mop-up duty. In fact, of the 15 appearances he made after his final start, 13 were in losses. A South Carolina native, O’Dell is currently 78 years old. O’Dell never played in the minor leagues. His brief appearances in 1954 & 1956 were due to his military service (which is where he spent all of 1955).